Imagine a world without institutions. It is a world where borders between countries seem to have dissolved, leaving a single, endless landscape over which people travel in search of communities that no longer exist. There are no governments any more, neither on a national scale nor even on a local one. There are no schools or universities, no libraries or archives, no access to any information whatsoever. There is no cinema or theatre, and certainly no television. The radio occasionally works, but the signal is distant, and almost always in a foreign language. No one has seen a newspaper for weeks. There are no railways or motor vehicles, no telephones or telegrams, no post office, no communication at all except what is passed through word of mouth. There are no banks, but that is no great hardship because money no longer has any meaning. There are no shops, because no one has anything to sell. Nothing is made here: the great factories and businesses that used to exist have all been destroyed or dismantled, as have most of the other buildings. There are no tools, save what can be dug out of the rubble. There is no food. Law and order is virtually non-existent, because there is no police force and no judiciary. In some areas there no longer seems to be any clear sense of what is right and what is wrong. People help themselves to whatever they want without regard to ownership – indeed the sense of ownership itself has largely disappeared. Goods belong only to those who are strong enough to hold on to them, and those who are willing to guard them with their lives. Men with weapons roam the streets, taking what they want and threatening anyone who gets in their way. Women of all classes and ages prostitute themselves for food and protection. There is no shame. There is no morality. There is only survival. For modern generations it is difficult to picture such a world existing outside the imaginations of Hollywood script-writers. However, there are still hundreds of thousands of people alive today who experienced exactly these conditions – not in far-flung corners of the globe, but at the heart of what is now considered to be one of the most stable and developed regions on earth. In 1944 and 1945 large parts of Europe were left in chaos for months at a time. The Second World War – easily the most destructive war in history – had devastated not only the physical infrastructure, but also the institutions that held countries together. The political system had broken down to such a degree that American observers were warning of the possibility of Europe-wide civil war. The deliberate fragmentation of communities had sown an irreversible mistrust between neighbours; and universal famine had made personal morality an irrelevance. 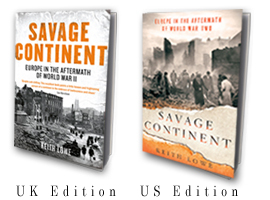 ‘Europe,’ claimed the New York Times in March 1945, ‘is in a condition which no American can hope to understand.’ It was ‘The New Dark Continent’. That Europe managed to pull itself out of this mire, and then go on to become the prosperous, tolerant continent it is today, seems nothing short of a miracle. Looking back on the feats of reconstruction that took place – the rebuilding of roads, railways, factories, even whole cities – it is tempting to see nothing but progress. The political rebirth that occurred in the west is likewise impressive, especially the rehabilitation of Germany, which transformed itself from a pariah nation to a responsible member of the European family in just a few short years. A new desire for international cooperation was also born during the postwar years, which would bring not only prosperity but peace. The decades since 1945 have been hailed as the single longest period of international peace in Europe since the time of the Roman Empire. It is little wonder that those who write about the postwar era – historians, statesmen and economists alike – often portray it as a time when Europe rose like a phoenix from the ashes of destruction. According to this point of view, the conclusion of the war marked not only the end of repression and violence, but also the spiritual, moral and economic rebirth of the whole continent. The Germans call the months after the war Stunde nul (or ‘Zero Hour’) – the implication being that it was a time when the slate was wiped clean, and history allowed to start again. But it does not take much imagination to see that this is a decidedly rosy view of postwar history. To begin with, the war did not simply stop with Hitler’s defeat. A conflict on the scale of the Second World War, with all the smaller civil conflicts that it encompassed, took months, if not years, to come to a halt, and the end came at different times in different parts of Europe. In Sicily and the south of Italy, for example, it was as good as over in the autumn of 1943. In France, for most civilians, it ended a year later, in the autumn of 1944. In parts of eastern Europe, by contrast, the violence continued long after VE Day. Tito’s troops were still fighting German units in Yugoslavia until at least 15 May 1945. Civil wars, which were first ignited by Nazi involvement, continued to rage in Greece, Yugoslavia and Poland for several years after the main war was over; and in Ukraine and the Baltic States nationalist partisans continued fighting Soviet troops until well into the 1950s. Some Poles contend that the Second World War did not really end until even more recently: since the conflict officially began with the invasion of their country by both the Nazis and the Soviets, it was not over until the last Soviet tank left the country in 1989. Many in the Baltic countries feel the same way: in 2005 the presidents of Estonia and Lithuania refused to visit Moscow to celebrate the 60th anniversary of VE Day, on the grounds that, for their countries at least, liberation had not arrived until the early 1990s. When one factors in the Cold War, which was effectively a state of perpetual conflict between eastern and western Europe, and several national uprisings against Soviet dominance, then the claim that the postwar years were an era of unbroken peace seems hopelessly optimistic. Neither did the end of the war signify the birth of a new era of ethnic harmony in Europe. Indeed, in some parts of Europe, ethnic tensions actually became worse. Jews continued to be victimised, just as they had been during the war itself. Minorities everywhere became political targets once again, and in some areas this led to atrocities that were just as repugnant as those committed by the Nazis. The aftermath of the war also saw the logical conclusion of all the Nazis’ efforts to categorise and segregate different races. Between 1945 and 1947 tens of millions of men, women and children were expelled from their countries in some of the biggest acts of ethnic cleansing the world has ever seen. This is a subject that is rarely discussed by admirers of the ‘European miracle’, and even more rarely understood: even those who are aware of the expulsions of Germans know little about the similar expulsions of other minorities across eastern Europe. The cultural diversity that was once such an integral part of the European landscape before, and even during, the war was not dealt its final death-blow until after the war was over. That the reconstruction of Europe was begun in the midst of all these issues makes it all the more remarkable. But in the same way that the war took a long time to end, so the reconstruction took a long time to get going. The people who lived amid the rubble of Europe’s devastated cities were more concerned with the minutiae of everyday survival than they were with restoring the building blocks of society. They were hungry, bereaved and bitter about the years of suffering they had been made to endure – before they could be motivated to start rebuilding they needed time to vent their anger, to reflect and to mourn. The new authorities that were taking up office across Europe also needed time to establish themselves. Their first priority was not to clear the rubble, or repair the railway lines, or reopen the factories, but merely to appoint representatives and councils in each area of their countries. These councils then had to win the trust of the people, the majority of whom had learned through six years of organised atrocity to treat all institutions with extreme caution. In such circumstances the establishment of some kind of law and order, let alone any physical reconstruction, was little more than a pipe dream. It was only outside agencies – the Allied armies, the United Nations, the Red Cross – that had the authority or the manpower to attempt such feats. In the absence of such agencies, chaos reigned. The story of Europe in the immediate postwar period is therefore not primarily one of reconstruction and rehabilitation – it is firstly a story of the descent into anarchy. This is a history that has never properly been written. Dozens of excellent books describe events in individual countries – especially in Germany itself – but they do so at the expense of the larger picture: the same themes occur again and again throughout the continent. There are one or two histories, like Tony Judt’s Postwar, that take in a broader view of the continent as a whole – however they do so over a much larger timescale, and so are obliged to summarise the events of the immediate postwar years in just a few chapters. To my knowledge there is no book in any language that describes the whole continent – east and west – in detail during this crucial and turbulent time. This book is a partial attempt to rectify this situation. It shall not, as so many other books have done, seek to explain how the continent eventually rose from the ashes and attempted to rebuild itself physically, economically and morally. It will not concentrate on the Nuremberg trials, or the Marshall Plan, or any of the other attempts to heal the wounds that had been created by the war. Instead it is concerned with the period before such attempts at rehabilitation were even a possibility, when most of Europe was still extremely volatile, and violence could flare up once again at the slightest provocation. In a sense it is attempting the impossible – to describe chaos. It shall do so by picking out different elements in that chaos, and by suggesting ways in which these were linked by common themes. I shall begin by showing precisely what had been destroyed during the war, both physically and morally. It is only by fully appreciating what had been lost that we can understand the events that followed. The second section describes the wave of vengeance that swept across the continent, and suggests ways in which this phenomenon was manipulated for political gain. 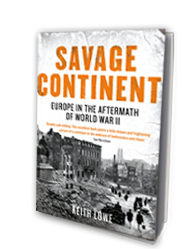 Vengeance is a constant theme throughout this book, and an understanding of its logic, and the purposes to which it was put, is essential if we are to understand the atmosphere of postwar Europe. In parts three and four I shall show what happened when this vengeance, and other forms of violence, were allowed to get out of hand. The ethnic cleansing, political violence and civil war that resulted were the some of the most momentous events in European history. I shall argue that these were, in effect, the last spasms of the Second World War itself – and in many cases an almost seamless link to the beginning of the Cold War. The book will therefore cover, roughly, the years 1944–1949. One of the main purposes of this book is to break away from the narrow western view that tends to dominate most writing on the period. For decades books about the aftermath of the war tend to have focused on events in western Europe, largely because information about the east was not readily available, even in eastern Europe itself. Since the break-up of the Soviet Union and its satellite states this information has become more available, but it still tends to be obscure, and generally appears only in academic books and journals, often only in the language of the originator. So while much pioneering work has been done by Polish, Czech or Hungarian writers it has remained only in Polish, Czech or Hungarian. It has also remained, largely, in the hands of academics – which brings me to another purpose of this book, which is to bring the period to life for the general reader rather than the academic one. My final, and perhaps most important purpose, is to clear a path through the labyrinth of myths that have been propagated about the aftermath of the war. Many of the ‘massacres’ I have come across turn out, on closer inspection, to be far less dramatic than they are usually portrayed. Equally, some quite astonishing atrocities have been hushed up, or simply lost in the sweep of other historical events. While it might be impossible to get to the exact truth behind some of these incidents, it is at least possible to remove some of the untruths. A particular bugbear of mine is the plethora of vague and unsubstantiated statistics that regularly come up in discussions about this period. Statistics really do matter, because they are often employed for political purposes. Some nations routinely exaggerate the crimes of their neighbours, either to distract attention away from their own crimes or to further their own national causes. Political parties of all colours like to exaggerated the crimes of their rivals, and downplay those of their allies. Historians also sometimes exaggerate, or merely pick the most sensational number from the range of figures available to make their stories seem more dramatic. But the stories from this period are fantastic enough – they do not need exaggeration. For this reason I have tried where possible to base all my statistics on official sources, or on responsible academic studies wherever those official sources are missing or suspect. Whenever statistics are in dispute I shall put what I consider to be the most reliable number in the main text, and alternative numbers in the notes. That said, it would be foolish to imagine that my attempts at accuracy cannot be improved upon. Neither can this book pretend to be a ‘definitive’ or ‘comprehensive’ history of the immediate postwar period in Europe: the subject matter is far too broad for that. Instead it is an attempt to shine a light on a whole world of surprising and occasionally terrifying events for those who might never otherwise come across them. My hope is that it will open up a debate about how these events affected the continent during the most painful stages of its rebirth and – since there is enormous scope for further research – perhaps stimulate others to investigate more deeply. If the past is a foreign country, this period in Europe’s history still has vast regions marked only by the phrase, ‘Here be dragons’.